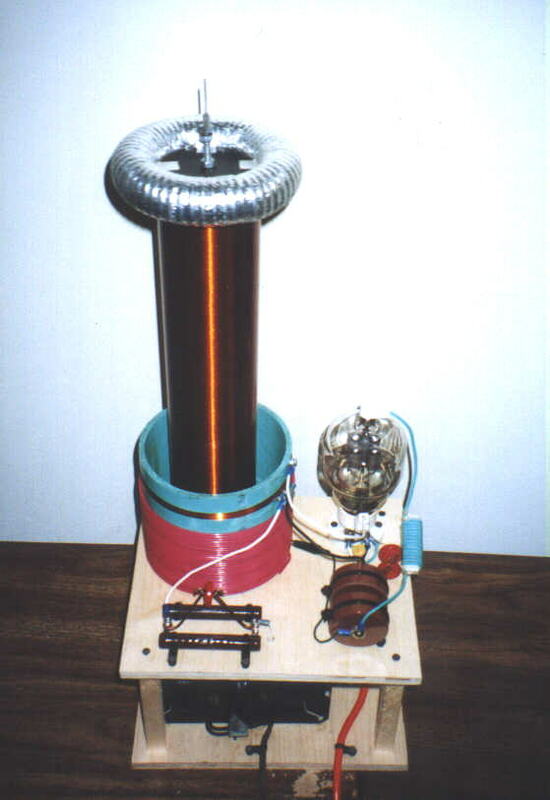 This was my second tube coil, constructed in winter of 2002. A nice gentleman by the name Paul Nonn, whom I met at a Tesla-thon donated a pair of 304TLs to my project. Unfortunately one of the tubes was damaged in shipping, but the other one was put to good use for some time, that is until its filament cracked from mechanical vibrations. That brings up something that one must consider when using very old vacuum tubes. Many old tubes have very brittle filaments and are usually damaged by too much jarring. Anyway, while it lasted it was a decent setup. It produced about 13" sparks from an unknown amount of power input, but I suspect less than 1000W. The tube ran cherry red, but is rated for this. Below are the spec's for this setup as well as some pictures of operation. Plate transformer is a 2100v MOT. 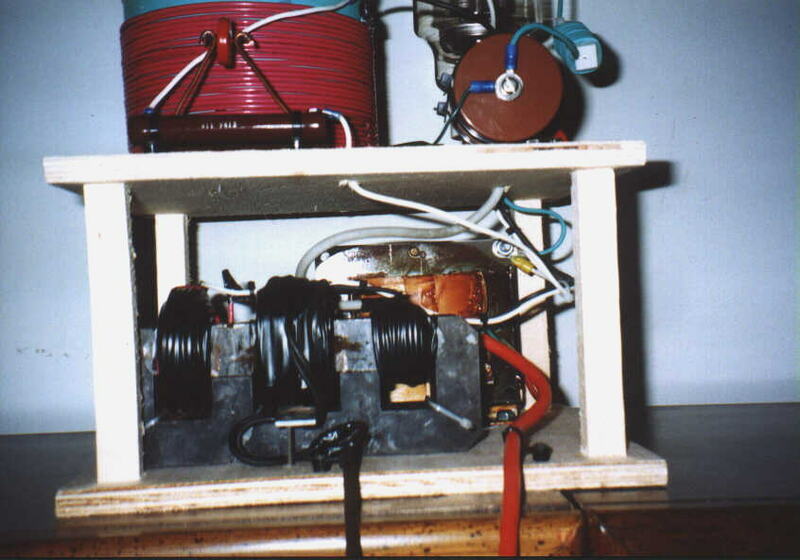 Filament transformer is 10.3v 13A. (measured) I really hate this thing now, and am searching for a plain old 10v 12.5A transformer that will probably be 1/3 the size of this thing! Tube: 304TL. Rated 3000v 900ma Plate (300w dissipation). Primary cap- 2 .002uf 40kv TDK caps in series for .001uf 80kv (10kv minimum rating needed for this cap). RF bypass is 2 .002uf 10kv ceramic discs in parallel. Filament bypass is a .001uf 10kv ceramic. Grid leak cap is .002uf 10kv ceramic disc. (3kv minimum rating needed for this cap). Grid leak resistor is 10kohm 50watt. Primary is 29turns of 12 solid on 6.3" PVC. Tapped at 29turns(need more turns!). If you build this design, use about 33 turns. I will have to go and add the extra turns. 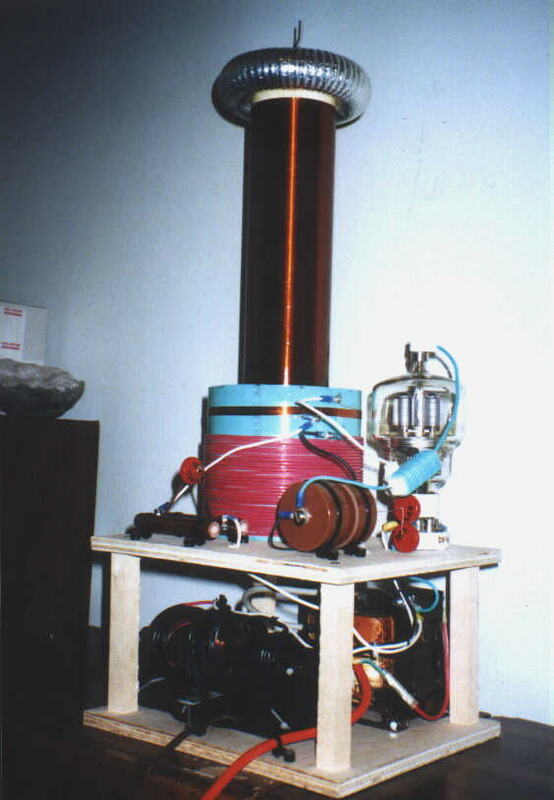 Grid coil is 20 turns of 26awg magnet wire 1.5" above the primary. Its on a separate adjustable form. Secondary is 3.5" x 17" winding of 26awg. 1.25"x7" toroid with breakout point about 4" tall.